I almost missed this. I'm a sucker for radical ideas in architecture and these are wild. Many of them were actually started, but were abandoned during WWII. 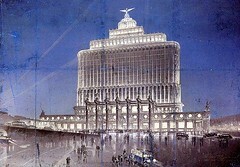 A virtual exhibition of drawings of unrealized architectural projects from Moscow 1920 to 1950, could easily have been entitled "Stalin's Wet Dreams." Some decidedly futuristic architecture, including a 415 meters high Palace of the Soviets." What's with blogger? You've got a bunch of question marks instead of the cyrilic or whatever crazy language it's supposed to be. Thanks for the comments on my biking footage. That video took a lot of work and it's nice to know that people are watching it. Hey, do you vlog? You have some really cool stuff on this site (like that LOTR animation) and you would probably make some very interesting vlogs. We have a alot of vloggers, but not very many really interesting ones and we always need more.